Hello, my name is Nancy and I am disorganized. There, I said it. They say that’s the first step: admitting you have a problem. Let me take it one step further for you. I’m a procrastinator. I always usually put off whatever I could be doing now. My biggest issue? Putting stuff away. So really, it’s actually not that I’m disorganized. It’s that I never put anything where it belongs, so it appears that I am disorganized. And it’s killing me. It was fine before I had kids. I could get away with a certain level of disorganization because I only had my own things to worry about. But now, with kids, it’s oh so much harder. Sometimes I feel like I might actually loose one of my kids in the clutter. And the thing is, I’m actually a slave to organizational systems. If I find a system that works and that my family buys into (this is key), hey, I’m all in. The trouble is (a) the family buy-in part, and (b) a system that works and doesn’t need to be constantly massaged. I was recently contacted by someone who obviously felt my messy vibes screaming through the universe and clearly believed that I would be a good candidate to review Barbara Reich’s book, Secrets of an Organized Mom. She could not have been more correct. While I wait for the book to be delivered, Barbara has offered to help me with a particularly bad spot in my house. 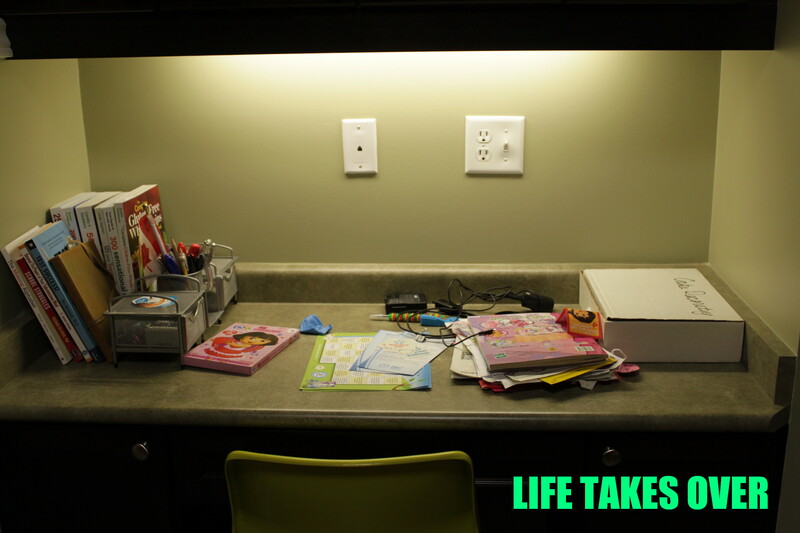 This desk space is in my kitchen. 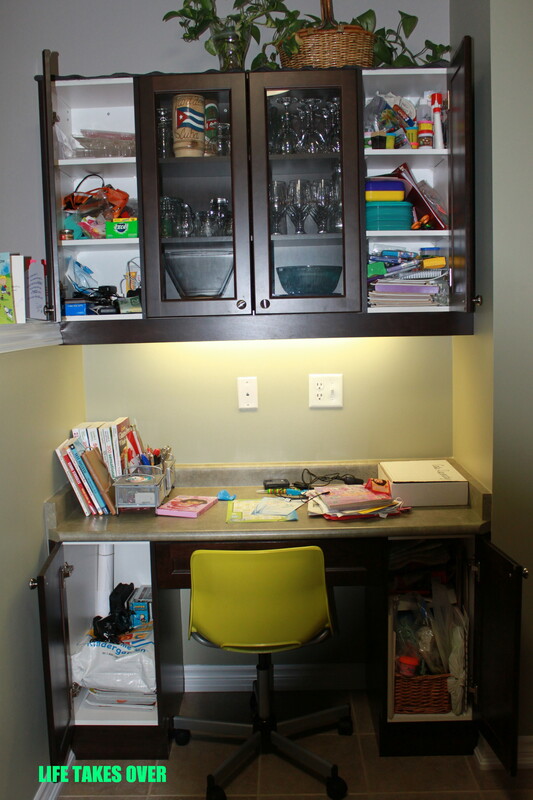 My original vision for this desk was a place for my kids to do homework while I cooked dinner. My laptop is generally set up on the desk (where it is in this shot I do not know). What the area has become is a catch-all for mail, the kids’ artwork, cookbooks, craft supplies and miscellaneous items that I cannot even name. Think about what you need to access the most frequently and put those things in the upper cabinet on the bottom two shelves that are easy to reach. Put what you don’t need as often on the top shelf. You could also use a desk organizer that has space for pencils and pens, and other office supplies. I like this from Land of Nod: http://www.landofnod.com/search.aspx?query=cubby%20cups. I also like this pen and pencil cup from Poppin: http://www.poppin.com/-Trays-Pen-Cups-/. I think this just might work for me. And now that my daughter is at an age where she can get her own supplies for drawing, colouring and crafts, this system Barbara outlines above just might help Big Sister take responsibility for her stuff. This entry was posted in Uncategorized and tagged Family, Kids, orgnization, Reviews & plugs, staying organized, stressed-out on February 11, 2013 by Nancy. interesting post, I think this thing is becoming epidemic since all people are so busy and have less time or skill to organize things. one thing that i think really works and helps the children learn to be organised is to have a day every month, where all the family try and sort things. If it is done every month it is easier cause objects don’t add up. you can make a fancy name for it and also make it fun.it is the day mom wants to spend time with children. I like that idea! I think I’m going to try it with my kids. Thanks!